Project is a popular way of organising work, where work is composed of complex non-repetitive tasks. Projects must have a clear begin and a clear end. Project Management as a discipline has been widely studied and practiced for the last half a century. Today there are many different Project Management paradigms in practice. While there are few popular Project Management frameworks, most large organizations have tweaked and customized and created a framework that works the best in their unique context. Project Governance is a management framework to make and carry out decisions in projects. While each Project Management paradigms and each framework is different there are some fundamental aspects of Project Governance that are common. Workflow: How the project begins, ends and all the steps in between that it goes through. Information: Inimitable system of record for the project that keeps all stakeholders on the same page about the current state, decision, goals, and imperatives. Meetings: A set of regular meetings in which status is reviewed and decisions are made. 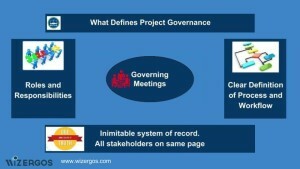 Below is a short video on Project Governance using Wizergos.